Bollywood needs to catch up with the times and stop being so problematic! Celebrity photographer Dabboo Ratnani has been shooting A-list Bollywood stars for his annual calendar for 20 years now. Before Koffee With Karan happened, this calendar shoot was what gave the relevancy stamp to the biggest stars of the moment. 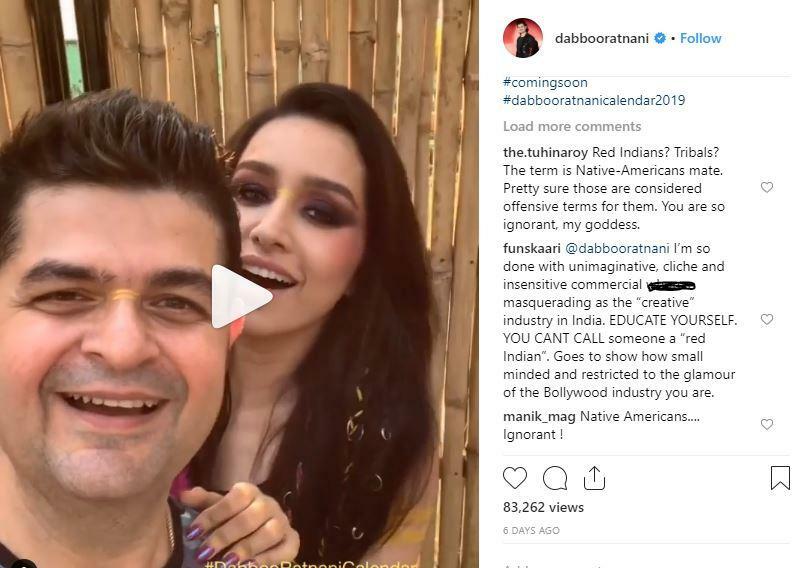 This year, his shoot with Shraddha Kapoor has landed them right in the middle of a controversy for using a sacred Native American war bonnet as a decorative costume. Accusations of cultural appropriation have been made towards them. These kind of headdresses or war bonnets are usually worn by the heads of Native American tribes who have earned a position of respect among their people. Earlier, they wore it while riding out to war, but now they mostly wear it for ceremonious purposes. Essentially, these war bonnets have cultural significance among the Native American tribes. People, mostly Caucasians and non-Natives, who have turned these war bonnets into Halloween costumes, have been called out in the past for culturally appropriating an oppressed group’s indigenous traditional arts and sacred objects without earning the right to wear them. Using them for commercial purposes that no way profits the oppressed groups also counts as cultural appropriation. Ratnani not only shot Kapoor in this headgear without considering these things, he also shared a behind-the-scenes video where he said, “I’ve with me an amazing tribal with me for the first time in my calendar. A Red Indian, actually,” perhaps without realising how problematic all of it sounded. People have been calling them out on social media for being so callous and disrespectful towards a community that still continues to face discrimination and persecution in many parts of the world. Nope, only tribal leaders and elders wear this. People who’ve bled and died for Native American communities over centuries. It’s not yours to “embrace” or commercialize. Would people be ok if she were posing for a photograph with a kirpaan or a skullcap or a turban?! Nope. According to a 2017 survey conducted for the National Public Radio, the Robert Wood Johnson Foundation, and Harvard T.H. Chan School of Public Health, “35% of Native Americans report personally experiencing slurs and 39% report insensitive or offensive comments specifically about their race or ethnicity. 38% of Native Americans say they or a family member have experienced violence because they are Native, with 34% also saying they have been threatened or non-sexually harassed because they are Native. Nearly one-quarter (23%) say they or a family member have been sexually harassed. It’s 2019, and everyone who is privileged enough to have access to books, television, and the internet needs to sock up and educate themselves before perpetuating problematic behaviour like this. Yes, Bollywood needs to catch up as well!